First thing in the morning, the four of us headed off on our first NCL excursion: to view some Mayan Ruins. 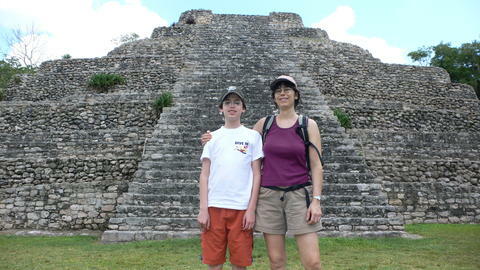 Ronnie is very much into the Mayan culture. The trip there took about an hour on a bus â€“ which is a bit long, but our guide filled the time with background about Costa Maya and the province in general. The ruins were way cool. It helped to have someone explain everything to us. We even purchased a book with details about the amazing Mayan calendar. We had it personalized for Ronnie, recording his birth date the Mayan way. 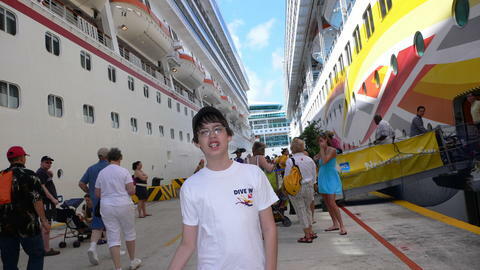 I have to admit I seriously disliked the set up at Costa Maya. 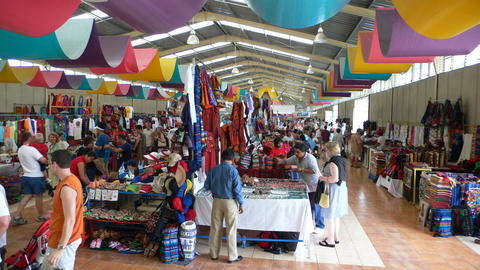 There was a good sized shopping area, and having been in Mexico before, I could see it was tailored to touristsâ€¦ costs were higher than I expected. I couldnâ€™t find the brandy my dad wanted (itâ€™s local stuff). They told us we could find the brandy outside the enclave. We tried to grab a cab as they dropped people off, but they wouldnâ€™t let us in. It seemed we would have to walk about a mile, away from guard-like folks patrolling the area, before we could get a cab. They were trying to keep tourists in. Granted, there wasnâ€™t much happening outside the enclave, but I didnâ€™t like the whole idea. 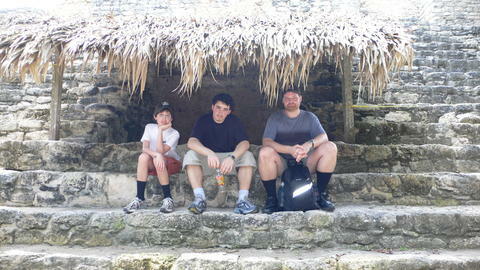 I had sprained my ankle slightly while visiting the Mayan ruins, so was unable to walk to get a cab. Reid did so, on his own, while I took the kids to the shopping area. We did spend a bundle on some cool t-shirts that are white indoors, but become coloured in the sun. We met up with Reid again (who had found the brandy!). We got our bathing suits on (Michael had had enough and went back to the ship on his own). We figured we could go swimming in the ocean. 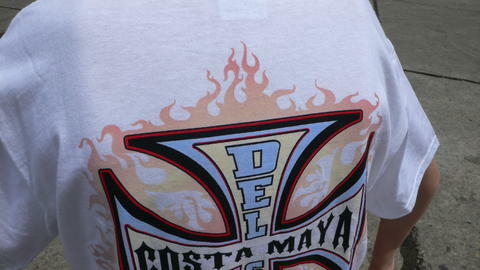 Thatâ€™s when I discovered another thing I didnâ€™t like about the port at Costa Maya. There was no beach â€“ just sharp rocks. We could swim in a pool â€“ but whatâ€™s the point of going to Mexico if you have to swim in a pool? I could see some beaches further along, but we couldnâ€™t get past a wall that enclosed the whole area. Guess we would have to walk out, get a cab and somehow hope to find a non-private beach. No way we were going to do that. Also, it started raining just as Ronnie and Reid decided to swim in the pool, so we headed back to the ship, somewhat disappointed. We had no excursions planned for Santo Tomas, figuring we could enjoy the ship while most people were off board. But we did go out to explore Santo Tomas a little. Having gone to a talk held on board that described many of the ports, I was prepared for Santo Tomas. They told us there wasnâ€™t much to do there â€“ it was basically a cargo port. Boy, were they right! Why on earth would they even bother going there? I think my plan to just sit back and enjoy the ship backfired a little (from my perspective). By Wednesday, the ship had become a little boring, and I was itching for something to do. 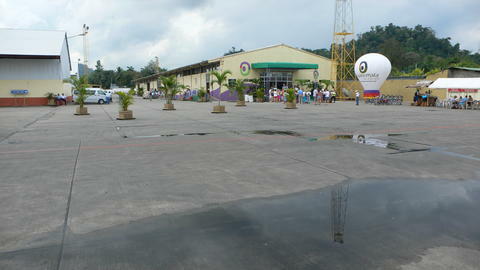 We went on shore to find a smallish, warehouse type place with little booths selling tourist stuff. No place to go swimming. No place else to go. We wandered around for a bit. Locals did some dancing and singing to entertain the tourists, but we just headed back to the ship and watched movies in our cabin. This was where we should have done an excursion. I heard later that the Banana Plantation tour was very interesting, and I regret not doing that. Reid had scuba diving lessons booked for Thursday. There was no way I was going to spend another day on board, and luckily one of the excursions to go to a beach that day was still open. I booked it for myself, Ronnie and Michael. Finally, a beach! If I had to pay for it fine, but Iâ€™d be damned if I didnâ€™t get a chance to swim in the ocean the whole trip! Some people who went on the banana plantation tour said it was especially interesting because their guide was a girl who had lived in New York until she was 16, then moved to Guatamala. She talked a lot about what life was like from a perspective shared by most tourists. All about politics, what you could and couldn’t do. She apparently said she liked it there and wouldn’t be leaving any time soon.